A team led by SF State researchers Weining Man and Zhigang Chen has developed a strange mix of solid particles and liquid with some unique optical properties. A laser beam shot through the mix becomes a needle of light that remains straight and robust over a distance four times as long as in a normal mix of solids and liquids. 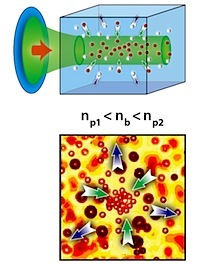 Positive-polarizability particles are attracted by an optical beam. The light can also render the material transparent, said Man, assistant professor of physics and astronomy, who notes that the light needles could find applications in optical communications technology, optofluidics for lab-on-chip devices and sensors, and controlled chemical reactions. Like a glass of milk or a cloud, the new material is a mix of solids and liquids--with a very important difference. Solids and liquids have different refractive indices, a measurement of how much light bends when it passes through one material to another. Solids tend to have higher refractive indices than liquids, meaning that they deflect light to a greater extent. 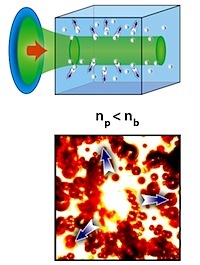 Negative-polarizability particles are repulsed by an optical beam. 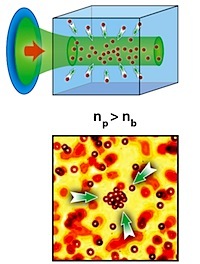 When both positive-polarizability and negative-polarizability particles are present an optical beam causes collective motion. But the material developed by Man and colleagues is not at all like a glass of milk. The researchers reversed the normal mix by suspending tiny Teflon-like solid particles with a very low refractive index in a glycerin-water liquid with a higher refractive index. “What this means is that light is going to interact with this material in different ways,” Man said. Man and Chen collaborated closely with Demetrios N. Christodoulides at CREOL/Univ. of Central Florida, a co-author of “Optical Nonlinearities and Enhanced Light Transmission in Soft-Matter Systems with Tunable Polarizabilities,” which was published in the Nov. 22, 2013 issue of Physical Review Letters.